Although it may be a good idea to delete some of your text messages to free up some space on your iPhone X or iPhone 8 so that you can update iPhone to iOS 12, you can accidentally delete really important messages in the process. Problems come up when you don't have a backup of these messages. 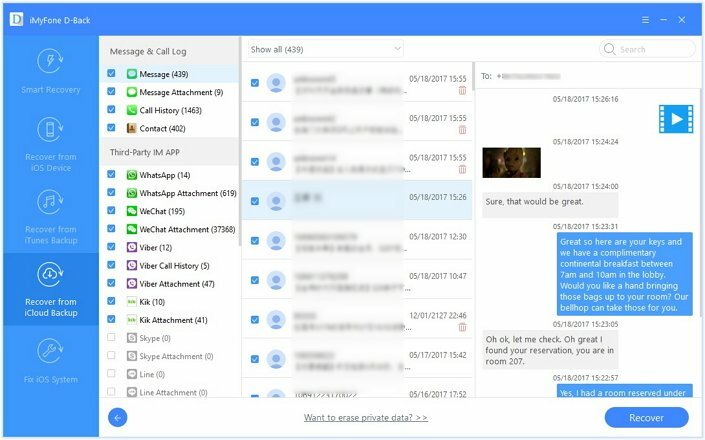 In this article, we will be looking at the different ways you can get your accidentally deleted text messages back whether you have a backup or not. Before starting to introduce the three methods, we can have an overview of all of them. If you also wonder why you need an iPhone recovery tool instead of using the official restore, you will find more detials within this article. If you hadn't backed up the text messages before deleting them, or wouldn't like to restore an iTunes or iCloud backup file, which will overwrite the current data on iPhone, we have an easy way to retrieve deleted text messages on iPhone. iMyFone D-Back is a powerful data recovery software that helps you get your messages back with or without a backup. The following are some of its main features. Deeply scan your iPhone and retrieve text messages even when you have no backup. Allows you to recover sms selectively or fully as you want. Compatible with iPhone XR, XS (Max), X, 8 and earlier iPhone and iPad, as well as all iOS versions, including the latest iOS 12. Allows you to view the text messages it finds and confirm whether they are what you need from iTunes/iCloud backup. Download this program and run it on your computer and launch it. The following tips instruct how you can retrieve deleted text messages from iPhone XR/XS Max/XS/X/8/7/6s/6/5 using iMyFone D-Back. You can choose "Smart Recovery" after you launch the software and click "Start". You need to choose the situation how you lost your messages. For example, if you delete or lost them recently by accident, simply choose "Lost or deleted data by accident". You will need to connect your iPhone to the computer. Now select Message as the file type you want to retrieve. 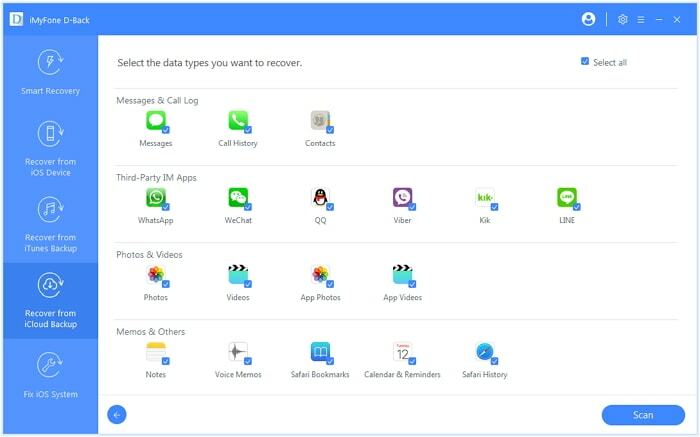 You can also recover photos, videos, notes, bookmarks and messages from 3rd-party IM App such as WhatsApp, Kik, WeChat and Line. When scanning is complete, you can view your messages list and select the text messages you want to retrieve. Then tap "Recover". The messages will be saved to the folder you have chosen as the storage path. It may be the most effective way to get your messages back, but it is not always a guarantee that you will restore them. You also can't selectively restore just the messages you need. But it is still worth a try if you have a backup. Here's how to do it. Step 1. Connect the iPhone with the PC you have synchronized your data on. Step 2. Open iTunes and you can see your iPhone appear. Select your iPhone and choose "Restore Backup...". Step 3. Now you can check if the deleted text messages are on your iPhone messages app now. Can’t view all the content of a backup which may cause you to choose the incorrect one which does not contain what you need. You cannot recover data selectively which means you have to restore everything including some unnecessary data. Once you complete a full restore, all of your current data and settings on your device will be replaced. This method is only workable if you’ve already made a backup, so if you haven’t done it already you cannot use this way. In order to prevent all these disadvantages, you can simply follow this method via D-Back. Step 1. From the main screen, choose "Recover from iTunes Backup" and then click "Start". Select the iTunes backup file that likely contains the deleted text messages and click "Next". Step 2. In the next screen, select the file type you wish to retrieve (in this case Message). Step 3. When the scanning process is complete, select the deleted text messages from the results displayed and click "Recover". If you have an iCloud backup of the messages, you can restore the backup to get them back. The main problem with this method is that you have to reset the device to factory setting first which will lead to data loss on the device. Here's how to do it. Step 1. Turn on Wi-Fi and tap Settings > iCloud > Backup. Make sure iCloud Backup option is on. Step 2. Tap Back Up Now and wait for the backup process. Make sure that your iPhone is connected to Wi-Fi during the process. Step 3. Then go to Settings > General > Reset, then tap Erase All Content and Settings. Step 4. 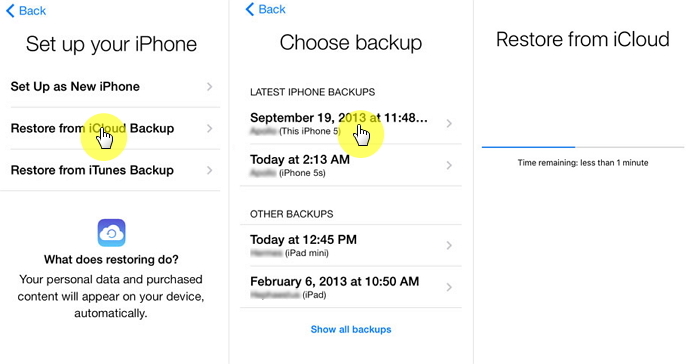 From the home screen, choose Restore from iCloud Backup, then sign in to iCloud. Choose a backup file from a list of available backups in iCloud. Step 5. Your new iPhone now displays all your messages from the old iPhone, along with all your other apps, photos, emails and other app data from last iCloud backup. You’re only provided with 5GB of free storage which is a very small amount. You’ll need to pay for extra or delete data frequently. Factors such as poor internet stability make it difficult to complete a backup, so you must make sure you have available backups. You cannot recover data selectively which means you have to restore everything with something you do not want. You have to erase all content and settings before restore and your device will be like a new one. If you just want to avoid the above disadvantages, feel free to recover text messages from iCloud backup via D-Back. Step 1. Select "Recover from iCloud Backup" tab and click on "Start". Sign in to your iCloud account and then select the iCloud backup file that contains your missing messages. Click "Next" the next window will allow you to select the type of file you wish to recover. Step 2. Choose "Message" and click "Next" to download and scan the iCloud backup. Step 3. Preview and select the text messages on the next window and then click "Recover" to get back the deleted iPhone messages. The trial version is free for download. 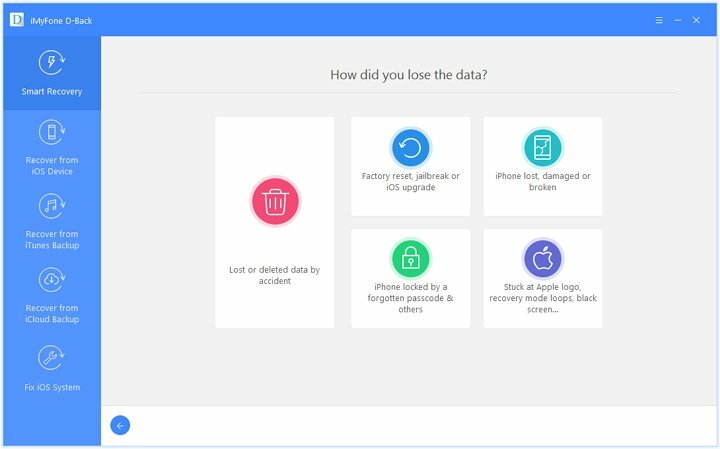 Why not try the iMyFone iPhone Data Recovery to retrieve deleted text messages on iPhone XR/XS Max/XS/X/8/7/6s/6 (Plus) now? If you want to retrieve only text message files instead the full backup from iTunes or iCloud to computer, simply have a try of the easy-to-use software iMyFone D-Back iPhone data recovery (compatible with iOS 12). It also upports to recover 20+ types of data such as photos, contacts, notes, Safari history, calendar, voice memos, etc. and many users have sent their feedback to us and here is only one of them. So even i lost my iphone 6+, the imyfone data recovery tool can find back my messages? 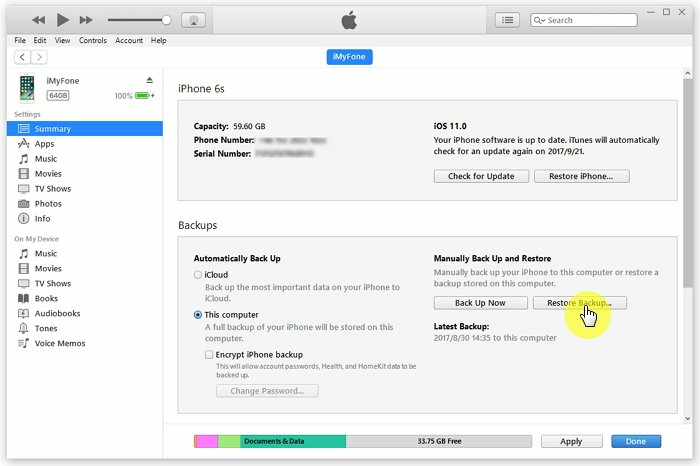 If you have backed up the lost messages onto your iTunes or iCloud, iMyfone D-Back could find it in your backup. And I suggest you to try the free trial version to detect the messages in your backup, Julian.